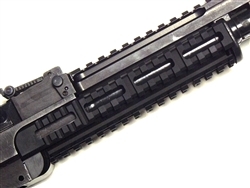 Bonesteel Arms skeleton rail system handguards for VZ rifles. Installs just like factory hanguards, using factory retainers. Super lightweight, only 4.96 ounces per set, complete with attachment hardware(lower 3.04 oz, upper 1.92oz) these provide a solid mounting point for all your Picatinny and/or M-LOK accessories. Utilizes original factory designed lower handguard tension spring to ensure a snug fit with no filing required. Includes a high strength polymer receiver adapter that mates nicely and improves fit. Includes 6 rail covers, covering 7 slots each, for a comfortable grip in all shooting conditions. *note: gas tube cover uppers are not intended for mounting aiming devices. I really like these new Skeleton handguard/rail by Bonesteel Arms. The new features of this rail make it so much better than the original set. The new upper skeleton rail is no different from the original version as it looks identical and the weight is the same. However the lower skeleton rail is a new design and has several advantages over the original lower rail. First it is much lighter, 3.12 oz. vs. 7.69 oz. Second, the rails at 3 o'clock, 6 o'clock and 9 o'clock allow for the attachment of picatinny and M-Lok products with no additional adapters. Third, the new lower skeleton rail is less bulky and cosmetically superior. When I did use the original lower rail, it looked way too big and I was always snagging stuff on its sharps edges. I do not have anything bad to say about the new skeleton set. But I really wish they would have redesigned the upper rail to allow for a lower profile. I realize the piston is directly below the upper rail but there is some room to lower it. Great product on my Century VZ2008. Contrary to product description, the upper is rock solid and easily supports an optic. Even co-witnesses with iron sights IF you use the lowest available picatinny mount and Aimpoint or clone. Very light and compact; sturdy; great fit. Interesting and functional rail covers. Not cheap but a good value for the quality you get. Mine did not come with instructions, but Chris Bonesteel provided good advice on fitment. Highly recommend.